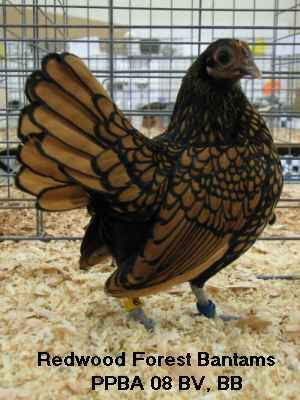 Golden Sebrights were the first purebred chicken I ever raised when I started raising show birds back in the late 70's. I was given my first pair by B.V. Knight of Fallbrook California who got his foundation stock from Bob Lamar. 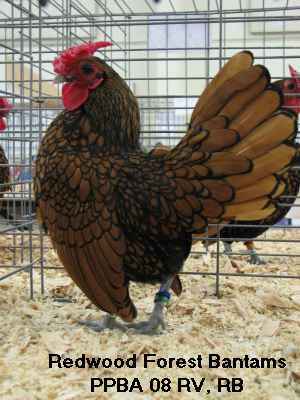 I was taken with these small bantams, but never had much success in breeding them. I exhibited the pair for many years and did very well with them in the jr classes. Years later I found myself wanting to keep chickens again and as we had a small residential backyard I obtained some Sebrights. Of course these were hatchery grade birds but none the less they were Sebrights. The hens are the perfect choice for working the garden over for bugs and snails, and their relative small size allows them to get in amongst the garden plants with out damaging even the most delicate of plants. Towards the end of 2005 I went on a quest to obtain show quality Goldens, as I wanted to get back into showing birds. In early 2006 I finally obtained 2 Cockerels and 3 Pullets from the Bonds', that became the foundation of my show flock.